It is just one of those days where I really am not in the mood for a beer. That of course does not mean I won’t have one though. I do have a tendency to not always finish what I start but this is one of those things I want to finish and I will finish it “God willing and the creek don’t rise!”. 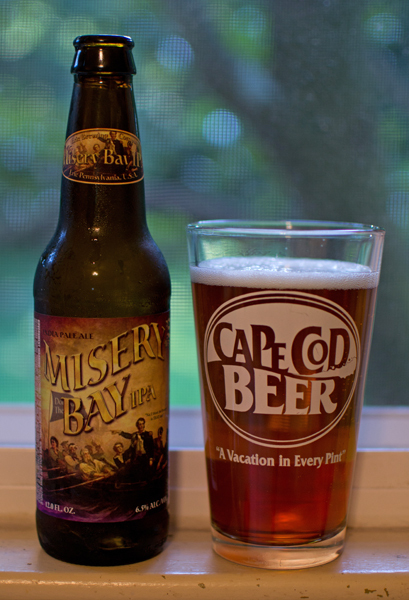 Beer #214 is Misery Bay IPA by Erie Brewing company. Erie hails from Erie , Pennsylvania. 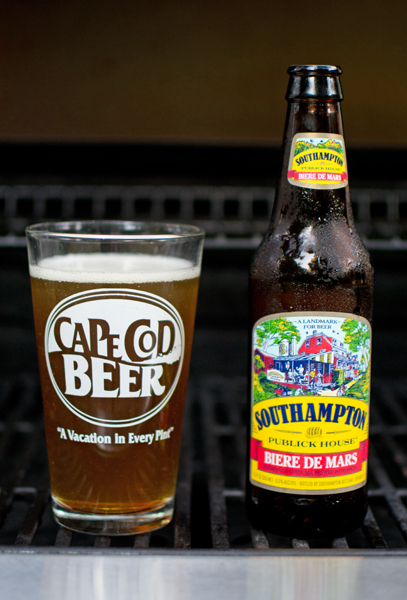 This beer is in the style of an American IPA with an ABV of 6.5%. This beer had a nice color to it that reminded me of honey with some orange tints to it. The head was thin and white. Typical IPA nose of pine, grapefruit, & caramel malts. Taste followed the nose with lots of sweet caramel maltiness and a huge, heavy pine flavor. I didn’t get any citrus in the taste at all. It had a nice overall bitterness but not over the top. It was a bit heavier in the mouth than I expected with some sharp, biting carbonation and an almost sticky feel. Another lazy hot summer day finds me lounging on my back deck again wondering silently to myself why can’t all weekends be of the three day variety? 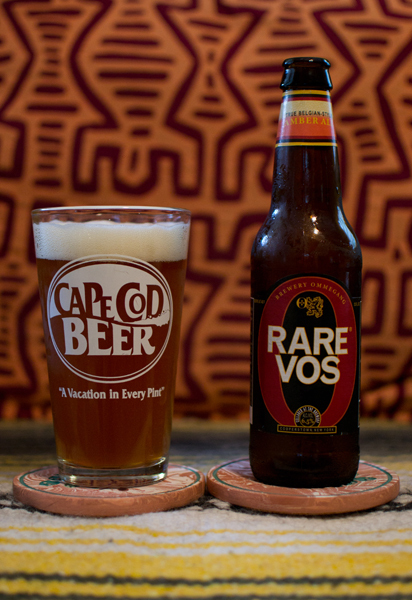 As I sit here with my shirt off (calm down now lady’s…), I find myself enjoying another fresh beer from Rehoboth Beach. 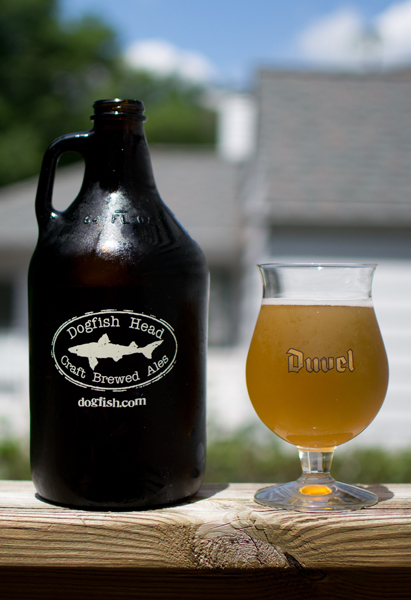 That beer, #211, is Festina Peche by Dogfish Head. 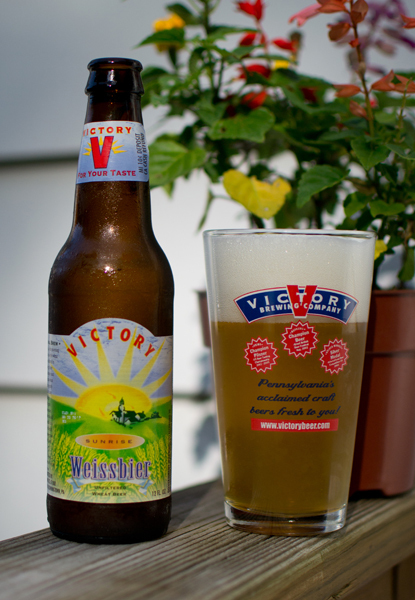 From Rehoboth Beach, Delaware comes this Berliner Weissbier with its ABV sitting pretty at 4.5%. I had no idea what a Berliner Weissbier was so off to Google I went. It turns out they are regional wheat beers from Northern Germany, in particular Berlin. They are bottle conditioned and use top fermenting yeast. Sounds good to me…lets go taste it…shall we? 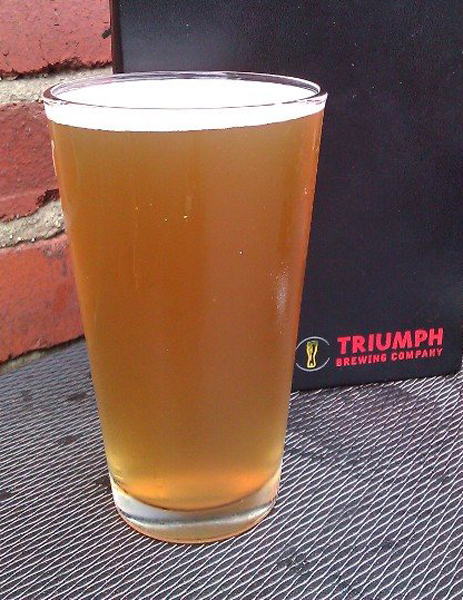 From the growler into my tulip glass, the Festina Peche had a pale yellow color that was quite cloudy. There was the tiniest of white heads that quickly disappeared. The nose was peaches and citrus. I love peaches and find them a summer staple fruit for myself so I was looking forward to tasting this. I took a sip…wow…very tart up front and then it got sour for the rest of mouthful. The sour component was new to me and I found myself enjoying it. The peach flavor hit me about mid-sip and lasted until swallowed. It was’t a very strong or sweet peach flavor but there was just enough so I had no mistake what fruit it actually was. It finished off very clean with no aftertaste whatsoever. It had a light body, bubbly carbonation, and was very crisp and refreshing. 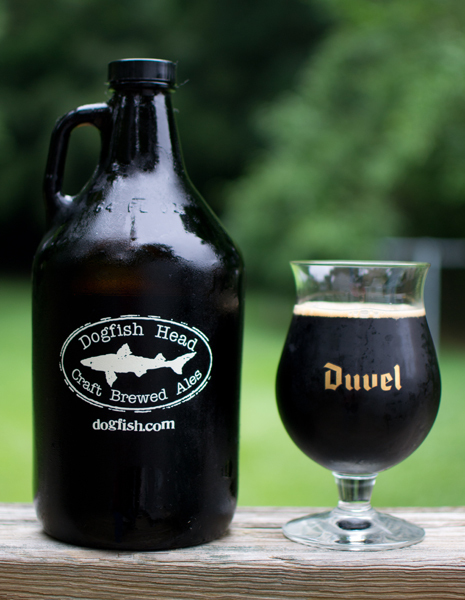 I thought to myself…there is no way the growler will see the light of day tomorrow. This was a unique beer for me with the sourness and was very delicious. It was very easy to drink, the alcohol seemed nonexistent, and was quite refreshing on this hot summer day. Another fantastic beer from Dogfish head and thanks again to my co-worker who brought this back from Delaware for me!